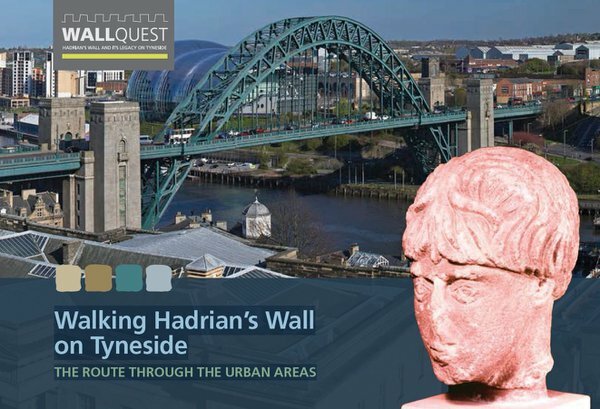 The Hadrian’s Wall Path National Trail (opened in 2003) avoids the actual line of Hadrian’s Wall through the urban areas of Tyneside, instead taking a riverside route for the 12 miles between the eastern end of the Wall at Wallsend and Heddon-on-the-Wall. Visitors and residents with a real archaeological interest in the Wall will want to follow the actual route the Wall took, and there are good reasons for doing so. The Wall has left its legacy in the street plan of Newcastle, especially the straight West Road out of the city, and Shields Road in the eastern suburb of Byker. Although the Roman remains are mostly invisible beneath the modern streetscape, there are places where they can be seen, and there is much else of interest to see, including the historic centre of Newcastle upon Tyne. Even in the urban areas the walker can appreciate the landscape through which the Wall ran: in this area it had to traverse a number of steep river valleys. Many of the most important archaeological discoveries about the Wall in recent times have been made in excavations in urban Tyneside, and the area contains three of the major garrison forts of Hadrian’s Wall. This guide offers a safe and practical route which runs as close as possible to the sites of these discoveries and the actual line of the Wall. The distance covered is around 12 miles (19km), just about walkable in a day, although most walkers will prefer to break the journey in Newcastle. Download our guide to walking Hadrian's Wall on Tyneside.